On the graph countries with universal health care are represented by a blue line, those without universal coverage have a red line. The United States and Mexico are the only countries with red lines. If you have trouble finding the United States at first it might be because U.S. health costs are so high, we didn’t even fit onto the scale of the graph. You’ll have to scroll up to the very top left corner of the chart to find us, where you’ll see that per person we spend well over twice as much as the average among these countries. You will also see that our line takes a sharp plunge to the life expectancy side of the chart– our life expectancy is actually one year shorter than average for industrialized countries. The thickness of the line represents how often we see a doctor. With costs as high as ours, you might expect that we at least go to see a doctor more often on average. Turns out though that we have less doctor visits than most other countries. On most measures comparing health care systems, the United States ranks dead last among industrialized countries. We rank 37th in the world in infant mortality, and 34th in maternal mortality– a woman in the United States is 11 times as likely to die during childbirth as a woman in Ireland. A recent report by the Robert Wood Johnson Foundation and the Urban Institute, looked at how well 19 developed countries succeeded in avoiding “preventable deaths,” (those where a disease could be cured or forestalled). The U.S. ranked 19 out of 19. Still, there are people like Senator Richard Shelby of Alabama who called Obama’s health care reform plan, “The first step in destroying the best health care system the world has ever known.” These “best health care system in the world” people have their own statistics, pointing out the few areas where we do better. They’ll say that we have lower mortality rates for certain kinds of cancer- breast and prostate cancer for example- than those other countries, which is true. They’ll point out that the wait time to see a specialist is lower in the United States- again true (except in Germany, which has shorter waits for specialists than here). We could counter these statistics with even more statistics (for example, in other countries you’re much more likely to get a same-day appointment with a primary care doctor, and waiting times in the emergency room are much longer here). 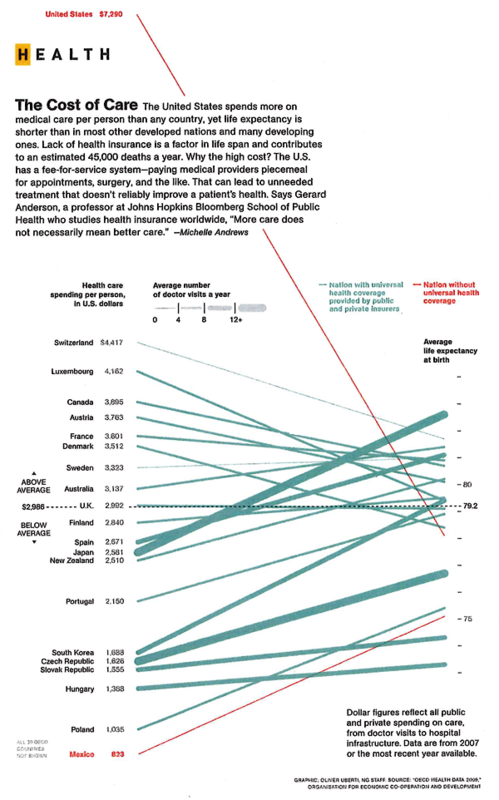 But then it seems like it’s just up for debate whether or not the U.S. has the best health care system. The implication is that it’s somehow close. It’s not. What this graph shows is that given how much money we spend per person, we should have hands down, unanimously the best health care system in the world. Americans should all expect to live to 160, and get a diamond covered walker when we turn 100. Yet instead, we spend on average two, three, in some cases four times as much per person as countries that have higher life expectancies than we do. Even if the health care reform bill passes, it’s just one step (although a major one) towards fixing America’s health care system. Moving forward, clearly there is still a lot we can learn from other countries. DIscovered this blog in conjunction with Econ Bk Club I belong to that is reading T.R. Reid’s The Healing of America….I so appreciate the presentation of straightforward FACTS such as info provided in the Nat’l Geographic graph. Tend to avoid traditional news outlets on the topic because I’m weary of the “melo-dramatic” soundbites and bipartison chest-beating. THANK YOU! T.R. Reid’s The Healing of America is a great book! As for the request– actually we’re in the middle of redesigning the site, and when we’re done there will be buttons for sharing individual posts on facebook, twitter, reddit, delicious… all that stuff. Look for that in the next week or two. But yeah, in the meantime, feel free to spread the word through “old fashioned” cutting and pasting! I read somewhere (though I can’t remember where and realize that a lack of actual stats/citations hurts the point) that the main reason the American mortality rates for some cancers are lower is because that is solely predicated on discovery and treatment numbers. Somewhere like Canada, where yearly check-ups are covered by government funded health-care, you’re quite likely to find out that you have cancer, but probably at stage 2 or 3. In the States, you’re either only going in when you really know something is wrong (stage 4, when it’s spread) and maybe having to give up because you can’t afford treatment and won’t put your family in debt, or you’re rich enough to get checked out frequently and catch it early and get the best treatment early and often. Without being able to remember where exactly I read it, I can’t vouch for how true that is, but it does make more logical sense than not. Could you please provide the documentation for the graph and specifics as to where I might find it (hopefully online)? I am trying to collect data to support defense of the act and I need original sources. Thanks! Rhonda– we originally found it in this short blog post on the National Geographic website: http://blogs.ngm.com/blog_central/2009/12/the-cost-of-care.html I think it was maybe also in their January issue. The source of the data in the graph was “OECD Health Data 2009,” which was put out by the Organization for Economic Cooperation and Development. They have the raw data online here, but you usually have to pay to access it. You have to click on that first link to see the graph. It looks like the graph is showing the US’s healthcare costs dropping significantly. I think. This is a really weird graph. If you click on the graph you should be able to zoom in. Then you can see that graph doesn’t show health care costs over time– it shows health care costs compared to life expectancy. The steep drop shows that we have extremely high health care costs, but only a below average life expectancy. Ridiculous lawsuit and litigation escalates the costs of healthcare ( and other things). If someone walks down the sidewalk looking at their cellphone, and falls into a hole bc of ongoing construction in the sidewalk, they should accept their own responsibility for their mistake. They blame and associated costs should not be placed on the construction company or the city. Also, the pharmaceutical companies charge ridiculous amounts for medicines. So wrong. The costs of medical school is out of control. THESE COSTS ARE WHAT ESCALATE THE COSTS OF OUR MEDICAL CARE.